Starting a craft distillery is a nearly impossible task. Getting approval from the TTB (Alcohol, Tobacco and Trade Bureau) could perhaps be the most difficult governmental task there is, and the fun doesn’t stop there. Every aspect of making spirits in America is so tightly controlled and regulated that, at almost every turn, there’s a mountain to climb and challenges to overcome. After a craft distiller has navigated all of those hurdles, there’s the matter of the time it takes to actually age whiskey. Some distillers have addressed this problem in fairly ingenious ways. Companies like Whistle Pig, High West, and Templeton Rye have looked to existing stocks of spirits for their initial releases. Rather than directly produce these spirits, these companies have looked to blend and curate their initial expressions of whiskey. The truth is there are some pretty phenomenal barrels of whiskey out there from fairly notable whiskey producers who can’t use all the barrels they produce. If a whiskey barrel doesn’t fit the flavor profile of a major brand, it’s often sold in an open market. Bull Run Distilling Co. has stepped into this space with Temperance Trader Straight Bourbon Whiskey (84.54 proof $29.95). Coppery in color, this bourbon has a nice, spicy-sweet nose with notes of cinnamon, clove, allspice, and oak, backed by light caramel, brown sugar, and vanilla. The entry is smooth and slightly sweet with caramel lead notes. Things get spicy in the mid-palate with a spike of clove and cinnamon. From the mid-palate, it’s clear that this is a ‘high rye’ mash build. The clove and cinnamon balance out wonderfully with deep toasted oak notes and thick undertones of vanilla and caramel. The finish is fairly long and it carries along the deep, toasted oak notes. The mouth feel of the Temperance Trader Straight Bourbon Whiskey is delightful, with the thicker sweet tones nicely balanced with the spicier notes. The toasted oak feels a little too strong in the finish but it’s a fairly minor issue. We love the fact that Bull Run Distilling Co. is upfront about the fact that they’re curating this bourbon, with “selected by Bull Run Distilling” on the front label. Also, we love the fact that they’ve brought this whiskey in under the $30 mark. 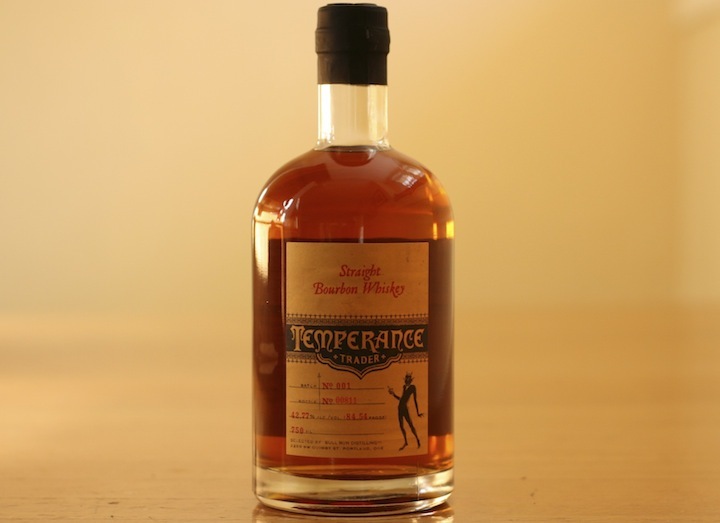 Temperance Trader Straight Bourbon Whiskey is available in Oregon and California.